The rapid development of technologies both new and improved will help all water users be more efficient. This section describes current and new technologies that can reduce water and energy consumption and associated costs. However, even the best technology becomes inefficient without implementation of proper operation and maintenance practices. For water conservation and efficiency tips, see ADWR Water Conservation Tips. For information about facility water-use efficiency, developing facility water-management plans and audits, see Conservation Tools for Facility Managers. In 1994, the State of Arizona adopted the International Plumbing Standard, which requires low-water-use plumbing fixtures in new construction and for replacement fixtures. The Arizona Uniform Plumbing Code sets requirements on pressure and limits on maximum flow rates and quantities of water used by plumbing fixtures. The current law requires the installation of 1.6 gallon-per-flush toilets, 1.0 gallon-per-flush urinals, and 2.5 gallon-per-minute faucets and showerheads in new construction and when replacing fixtures in existing construction. A variety of low-water-use toilets, showerheads, faucet aerators, and other water-saving devices are available for replacement or new construction, some of which are described below. According to the EPA, the average household loses more than 10,000 gallons of water each year through leaks, which is the same amount of water needed to wash 280 loads of laundry, take 600 showers, or meet the average family's water needs for a month. Some water leaks are slow and difficult to detect, yet even the smallest leaks can add up quickly. The Smart Home Water Guide can help you find and fix leaks that are draining your budget. According to the EPA, toilets alone can use 27% of household water. Water consumption of pre-1980 toilets often exceeded 4 gallons per flush, and in pre-1990 toilets, more than 3.5 gallons-per-flush. The toilet's manufacture date can usually be found on the underside of the tank lid or on the tank itself. The current Arizona Uniform Plumbing Code (Title 45, Article 12) requires that toilets use a maximum of 1.6 gallons per flush. This amount may be greatly reduced by installing newer, high efficiency toilets (HETs). Whether new or old models, fixing a leak as soon as it occurs is very important, as leaky toilets can waste up to 200 gallons of water a day. Leaky toilets can lose 200 gallons of water per day, so it’s important to check for leaks. Be observant and listen, and you may be able to hear the water moving from the tank to the bowl, unrelated to flushing. An easy way to detect a leak is to deposit a few drops of liquid food dye into the tank; if the dye appears in the bowl of the toilet, the valve may be leaking or the flapper may not be seated correctly in the tank. Toilets that comply with the Arizona code standard of 1.6 gallons or less per flush are sometimes called ultra low flow (ULF) toilets. High-efficiency toilets (HETs) go beyond the standard and use only 1.28 gpf, a 20% savings. A high-efficiency toilet can save 4,000 gallons of water per year. The EPA Water Sense Tank-Type High Efficiency Toilet Specification summarizes the criteria for single- and dual-flush water efficient toilets. The document also includes fill-valve integrity, tank-trim adjustability and fixture performance-testing protocols. A dual flush toilet has two options for flushing: one that uses 0.8 to 1.2 gallons per flush for liquid waste and one that uses 1.6 gallons per-flush for solid waste. This "half flush" and "full flush" technology can reduce water usage by up to 67 percent. These toilets have a sensor that uses a beam of infrared light to activate flushing. In contrast to toilets that rely on a water tank and gravity to flush the contents, tankless toilets waste less water per flush. They employ a flushometer, which is a device that releases a metered amount of water into the toilet, then closes back up. Toilets with flushometers are most commonly seen in public restrooms and places of business. High-efficiency urinals comply with the Arizona code standard of less than 1 gallon of water per flush. Ultra low volume urinals, sometimes called “wash-down urinals,” use between 0.5 and 1 gallon of water per flush. Depending on the brand or model, the flushing mechanism may be located on top of the fixture, on the wall above the fixture, or may be automatic. These urinals have a sensor that uses a beam of infrared light to activate flushing. The sensors identify when the urinal has been used (or when someone has stood in front of it and moved away), which activates the flush. The controls are designed to prevent activation by passers-by and to reset after use to accommodate the next person. There is no need for the user to contact an activating device, which may be helpful to people with disabilities and also helps prevent the spread of disease. Retrofit kits are available for home use. Waterless urinals use no water for flushing, although they do require a small amount for cleaning. A waterless urinal can save up to 45,000 gallons of water a year. Waterless urinals are typically found in large complexes such as ballparks, office buildings and airports. A cartridge and liquid sealant is used to prevent odors in the u bend. The cartridge must be cleaned with a small amount of water and periodically replaced. According to the EPA, faucets and showerheads can use 33 percent of household water. This amount may be greatly reduced by installing water-efficient models. The Arizona Uniform Plumbing Code requires the flow rate of faucets and showerheads to not exceed 2.5 gallons per minute. Buildings older than 1990 may not have water-conserving plumbing fixtures, and flow rates could be more than 5 gallons per minute. Following is a description of some of the newer faucets available and devices that help reduce faucet water use. Low-flow aerators are extremely effective at reducing water use. Aerators can be attached to older, high-volume faucets to reduce their flow rate to 2.5 gpm or less. Aerators add air to the flow stream, resulting in a spray- like flow, while maintaining water pressure. Some aerators can reduce water flow to .5 gpm or less, at a fraction of the costs of replacing faucets. The rated flow of an aerator is imprinted on its side. Automatic faucets prevent water from flowing when the faucet is not in use. These faucets have a sensor that uses a beam of infrared light to control faucet flow. The flow starts when one’s hands are placed directly underneath the fixture and stops when hands are removed. Automatic faucets save 10-50 percent of water used by manual faucets. These faucets are helpful to people who have difficulty grasping or turning knobs. Metered (or self-closing) faucets deliver a measured amount of water for a specific length of time so that the faucet automatically shuts off once the pre determined limits are met. This eliminates water lost from unnecessary flow. While the flow rate of standard showerheads is 2.5 gpm, you can find showerheads with flow rates as low as 1.2 gpm. These low-flow showerheads work by injecting air bubbles into the stream of water resulting in a spray-like flow, while maintaining water pressure. This type of showerhead reduces the water flow to a trickle when the water reaches a certain temperature, thereby saving hot water until the shower is entered. The showerhead has a handle or pull leaver to release the warm water when the user is ready. This device saves both water and the energy used to heat the water. This showerhead has a handle that slows water flow to a trickle while the user soaps up, shaves or shampoos. When the flow is resumed, the water is the same temperature as it was before being temporarily turned off. In a traditional hot water system, a water heater heats water which then flows from the water heater to each faucet or showerhead in the home or facility. After each application, water remains in the pipes where it cools down. The next time hot water is required, the cool water in the pipes is often allowed to run until hot water becomes available, wasting between 8,000 - 20,000 gallons a year. Systems that provide hot water immediately on demand (or instantaneously) are described below. In these systems, water in the hot water line recirculates between the faucet and the water heater so that the water stays hot. This prevents the practice of letting water run down the drain while waiting for heated water. The system consists of a hot water line that loops from the water heater to the farthest fixture and back to the water heater, a pump to recirculate the water, thermostat, isolation valve and check valve. Systems may include a timer that can be set for a specific time of day or a switch to start the water circulating. Significant water savings can be realized, especially, when hot water has to travel a significant distance to the farthest fixture. 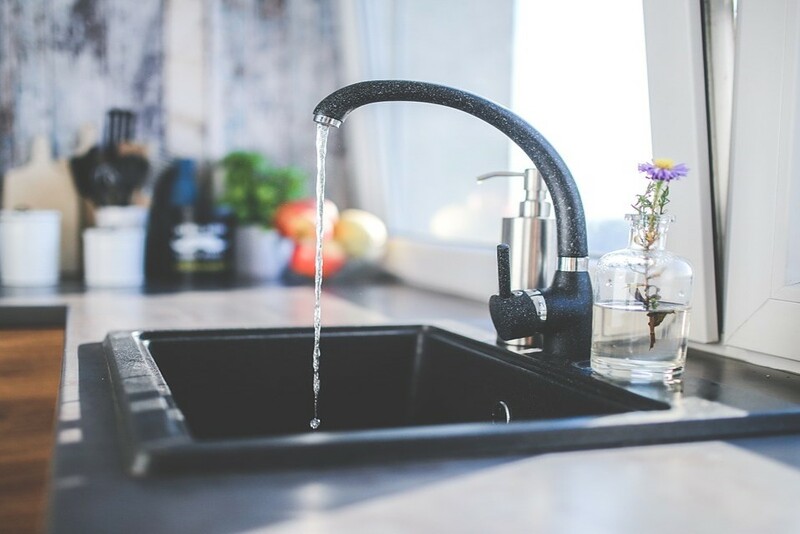 According to manufacturers' estimates, the average home wastes between 11,000 and 15,000 gallons of water every year as people wait for hot water. Re-circulating systems are sometimes required in new construction. Rebates and discounts may be available for retrofits of existing homes and buildings. A "point of use" water heater is installed directly under the sink or where ever hot water is required and produces hot water instantly. A tankless water heater can be located at the point of use and provides unlimited, instantaneous hot water. It does not have a storage tank, and gas models often do not have standing pilot lights, thereby saving energy. Water softeners remove the "hard" minerals such as calcium and magnesium from water that lead to soap deposits on bathtub and sinks, dull-looking laundry, spotty dishes, and scaly deposits on fixtures, water heaters and pipes. In a typical softener, the water exchanges its calcium and magnesium "hard" ions for the "soft" sodium ions contained in synthetic resin beads in the softener tank. Once the sodium supply in the resin beads has been exhausted, it is replenished by backwashing a water/salt solution (brine) through the resin beads. This process, called "regeneration", uses between 15 and 120 gallons of water for every per 1,000 gallons softened, depending on the type of unit. Large facilities often control softener regeneration frequency with timers or water meters which initiate the regeneration process when a predetermined amount of water has been treated. The best systems have controls that monitor water quality and initiate the regeneration process when the softened water becomes slightly hard. At smaller facilities, softeners are serviced by a water treatment company and their components are regenerated off-site at the vendor's facility. Want to learn more about water softeners, salinity issues and solutions, as well as where to find water professionals who are certified on water-softener sustainability? Check out the Arizona Water Quality Association's website. There are several ways to purify water. Two common methods are reverse osmosis and filtering. In reverse osmosis (RO), water is forced through an ultra fine membrane which separates clean water from the brine. RO removes nitrates, sulfate, sodium and total dissolved solids. Household RO units recover only 5 to 15 percent of the water entering the system, due to low back pressure. In other words, to make 5 gallons of purified water, 40 to 90 gallons of water are discarded. Filtering water is usually accomplished with charcoal filters installed in faucets, icemakers, and other fixtures. Charcoal has a large porous surface area that absorbs sediments and impurities such as gases, chlorine and organic contaminants that have undesirable flavors or odors. Activated charcoal has been heat-treated to increase the pores and therefore the surface area. Charcoal filters do not remove nitrates, bacteria or dissolved minerals or salts. For water that is high in contaminants, a unit that combines reverse osmosis and charcoal filtration could be beneficial. Water monitoring test kits are usually used by homeowners with wells or when water contamination is suspected due to undesirable taste, odor and/or color. The easy-to-use kits test water for total coliform bacteria, nitrates, total dissolved solids and pH levels. Cooling towers are used for large-scale air-conditioning systems and to cool the circulating water used in oil refineries, chemical plants and power stations. These systems consitute one of the largest non-residential water consumers. Water that falls through the tower is cooled due to evaporation and then returned to the top of the tower. The water that drops into the basin is on average 10 degrees F cooler than the water returned to the top. The towers vary in size from small roof-top units to very large structures; the taller the tower the greater the temperature drop. Water is lost from a cooling tower by evaporation, drift, and bleed-off (water used to carry away tower-damaging mineral buildup; also known as blow-down). Water that must be added to the system to make up for these losses is called "makeup water." Evaporative losses from a cooling tower can be estimated at 3 gallons per minute for every 100 tons of cooling. That means that a tower or condenser that provides 500 tons of cooling evaporates almost 21,600 gallons over a 24-hour operating period. One of the major ways to improve cooling tower water efficiency is to reduce the amount of bleed-off (water used to carry away minerals). Water use can be reduced by 20% or more by circulating water through the tower more times before bleed-off occurs. This will result in a higher concentration ratio (or cycles of concentration). A cooler's concentration ratio is its measure of water use efficiency. The higher the ratio, the more water-efficient. Cooling tower bleed-off could be used to irrigate plants that are not sensitive to its high salt content. Another reuse option is to convey the bleed-off to water-treatment plants. Not only would these practices save water, they may save money through reduced water and sewer costs. The use of sulfuric acid in the chemical treatment program of a cooling tower prevents scale buildup, so water can circulate more times before it is discarded, or before make-up water is added. If sulfuric acid treatment is not feasible or practical, carboxylated polymers (carboxylates) can be used instead to control the system’s pH and prevent scale. The solubility of carboxylates is less than sulfuric acid, but still more than double than without treatment. This device automatically controls blowdown based on the maximum cycles of concentration that can be safely achieved. The resulting conductivity (typically measured as microSiemens per centimeter, uS/cm). A conductivity controller can continuously measure the conductivity of the cooling tower water and discharge water only when the conductivity set point is exceeded. Evaporative coolers (also referred to as swamp coolers) increase the humidity of incoming air being drawn into a building, which decreases its temperature. After a short period of operation, re-circulating water in an evaporative cooler assumes the temperature of the entering air. This temperature is theoretically the lowest temperature to which the entering air may be cooled. The principal opportunity for conservation of the water used by evaporative coolers is to reduce the flow of bleed-off water discharged from the coolers. Typically, only a very small stream of bleed-off water is necessary for proper operation; but unfortunately, excessive amounts of water are often bled off. Not only does this waste water, it impairs the cooling efficiency of the cooler because the water does not become as cold as possible. The three common types of evaporative coolers are recirculating, so-called "dump pump" coolers and non-recirculating, or "once-through" coolers. The bleed-off from all types of evaporative coolers can be used to irrigate plants that are not sensitive to the water's high salt content. In this type of cooler, water that runs off the pads is captured and recirculated several times before it is discarded. A small amount of bleed-off is necessary to control concentrations of contaminants in the re-circulating water and prevent damage to the cooler's pads, thereby allowing it to operate effectively. Bleed-off valves can be adjusted to discharge the minimum amount of water necessary. Recirculating evaporative coolers use about 3 gallons of water per hour of operation. The “dump pump” variety automatically empties and refills the water-collection pan every few hours of operation. In dry climates, equipment may be cooled by a "once-through" or single-pass of water. This is the most water-intensive cooling process because after passing through and cooling the equipment, the water is often discarded. Equipment which might be cooled by once-through water include: degreasers, rectifiers, hydraulic equipment, x-ray machines, condensers, viscosity baths, air conditioners, air compressors, hydraulic presses, welders and vacuum pumps. Many types of water-cooled equipment can be replaced with energy-efficient, air-cooled models. Water use can also be reduced through re-circulation, by using water from non-potable sources and by reusing the once-through water for other purposes such as landscape irrigation or a cooling tower. These practices may not only save water, they may save money through reduced water and sewer costs. In Arizona's active management areas, ADWR prohibits the use of once-through cooling water by industries that have their own wells unless the water is reused. Boilers are used in large heating systems or in industries where large amounts of process steam are used. Water is added to a boiler system to make up for the water losses and to replace water lost when the boiler is blown down to expel any solids that may have built up. Wherever practical, steam condensate should be captured and returned to the boiler for reuse as make-up water. A condensate return system saves water, reduces the costs of pretreating the boiler feed-water and reduces energy consumption. Boiler operating costs can be reduced up to 70 percent by installing a condensate return system. Water consumption by boiler systems vary depending on the size of the system, the amount of steam used, and the amount of condensate return. An expansion tank provides a cushion of air for the expansion of water as it heats. This saves water in two ways: 1) it prevents the pressure relief valve from having to open and discharge water to relieve the pressure and 2) it eliminates the need to use cold water in mixing valves to cool the blow-down because the blow-down condenses and cools in the expansion tank. In a steel expansion tank the air and the water touch each other. In a bladder-type expansion tank the air and the water are separated by a diaphragm. Humidifiers are used to add moisture to the air through evaporation, thereby increasing relative humidity levels. There are two major types of humidifiers: room humidifiers and central humidifiers. Room humidifiers are self-contained units that are not usually connected to water supply lines. Their reservoirs are manually filled. Central humidifiers are usually connected to the central heating system and water supply lines. Their reservoirs are automatically filled. Humidifiers that have a continuous bleed-off system waste water. In these humidifiers, a constant stream of water leaves the reservoir and enters the sewer system at the same time a constant stream of potable water fills the reservoir. Recirculating humidifiers do not continuously drain and replace water. There are concerns about the possibility that recirculating humidifiers may contribute to “sick building syndrome.” An alternative would be to reuse the discarded water for another purpose, such as irrigating landscapes, rather than sending it to the sewer. Another option is to adjust the humidifiers to discharge the minimum amount of water necessary and avoid excessive bleed-off. Timers can be used to turn humidifiers on or off based on seasonal needs, or to control when water is pumped out of the reservoir to remove mineral build up. Mist cooling systems have become available to businesses and homeowners as an outdoor cooling option in regions with high temperatures and low humidity. Water is pumped through the system and released in a fine spray which evaporates, forming cool barriers against hot, dry air. Each misting nozzle uses about half a gallon of water per hour. To conserve water, the systems should be operated only when people are using the area. Some systems have sensors to turn misters off when no one is present, or on/off switches that can be activated by customers as needed. It is also desirable to use misters with nozzles than can be independently controlled, to direct nozzles properly so that the system only cools the area intended, and to turn off misters when it is too windy or humid for them to work well. Washing laundry is very water intensive, using approximately 25 percent of a household’s indoor water use. Conventional top-loading washing machines use 39 to 43 gallons of water per load. High efficiency models such as front-loading washers can greatly reduce water use. Small machines (those under 4.0 cubic feet) that use less than 6.5 gallons of water per cubic foot can reduce water use by up to 50 percent. For additional information see: Water and Energy-Saving Tips for Clothes Washers Or, visit the EPA Water Sense and Energy Star websites to find water-efficient clothes washers. Front-loading washers, also known as horizontal axis (H-axis) washers,are the most efficient washers available, using less than half the water of older, top-loading models. Front-loading washers tumble clothes through a small amount of water instead of using a central agitator in a full tub of water. Because they are only partially filled, they use less water and less energy for heating water. They also use faster spin speeds to extract more water from clothes, thereby reducing dryer time and energy use. The estimated savings per household is approximately 7,000 gallons a year. Advanced top-loading washers use sophisticated wash systems to flip or spin clothes through a reduced stream of water. Many have sensors to monitor incoming water temperature closely. They also rinse clothes with repeated high-pressure spraying instead of soaking them in a full tub of water. These water-saving, top-loading washing machines use an average of 25 gallons per wash compared to the average of 40 gallons per wash for conventional top-loading machines. Commercial laundry equipment can be found in hotels, motels, resorts, hospitals and other facilities for washing linens, uniforms, and other items. Prior to regulations enacted in 2005, commercial laundromats often used residential style, top-loading washing machines that were not bolted to the ground. Laundromats are now switching to horizontal-axis and multi-capacity load washing machines that are secured to the ground. For additional information see: Water and Energy-Saving Tips for Commercial Laundry Facilities and Energy Star Commercial Clothes Washers. The most common instituion-size washing machine is the washer-extractor, which can handle 25 to 400 dry pounds per load. A rotating drum agitates the laundry during washing and rinsing cycles, and spins at high speeds to extract the water. The machines refill with water for each new cycle. There is no internal recycling; all water used is discharged to the sewer. Typical water consumption for washer-extractors is 2.5 to 3.5 gallons per pound of dry laundry. The continuous-batch washer or “tunnel” washer, commonly used in Europe, has recently been installed in many U.S. laundries. In contrast to conventional washers which refill with water for each cycle, continuous batch washers reuse rinse water from all but the first rinse. The washers have one or more modules for each process step, and the laundry items pass automatically from one module to the next. Significant water conservation is achieved due to the use of counter-current flows. Properly operated installations can save 60-70 percent of the volume of water and steam required by washer extractors. Laundry wastewater reclamation systems recycle wash water. They capture, filter, and treat the water so it can be reused in the next load. A simple recycle system (one that does not treat the reclaimed water) collects discharge from the final rinse of one load and uses it in the first flush of the next load, saving about 10-35 percent. A complex recycling system (one that treats the reclaimed water and uses it in all cycles) can save up to 90 percent. Recycling systems can be cost-effective due to savings in water, soap, energy for heating, and sewer fees. Two types of complex systems are 1) mixed media and 2) ultra filtration. The mixed media system consists of a filter containing plastic beads, anthracite coal and silica; an activated carbon column; and an ion exchange unit. It first filters out large particles such as lint, then smaller ones such as dirt. After the ion exchange unit removes organic material, the water is sent back to the wash cycle. This system is relatively low maintenance and is available as a packaged unit. It provides approximately 75 percent reuse of water. The second system uses settling, high-rate ultra-filtration, and fixed bed carbon adsorption processes that sends the used water through the carbon bed. Pretreatment with hydrated lime in dry powder form is used to assist the ultra-filtration treatment. Multi-family housing complexes that have laundry rooms have been found to use less that 1/3 the water when compared to in-unit washers. Tax credits may be avilable for multi housing complexes and laundromats that replace older washers with new, low-water-use models. Find more information in this Laundry Wise Report. Kitchens, whether residential or commercial, typically include several water-using appliances, fixtures and equipment. There are many ways to save water in the kitchen. Look for WaterSense and EnergyStar labels, and consider the features described below. For more on commercial kitchens, see the Water Saving Technologies for Commercial Kitchens. Garbage disposals grind solid wastes into small particles so that they can be discharged into the sewer. The ground garbage passes into a chamber where it is mixed with water for disposal. Garbage disposals generally use five to eight gallons of water per minute, but have a relatively low duration of operation. Most commercial garbage disposals have solenoid valves that shut off the water when the disposal motor shuts off. Replacing a garbage disposal with a garbage strainer reduces water use by as much as 40 percent. A recirculating stream of water passes over food waste in the strainer (which sits in the sink's drain) and washes soluble materials and small particles into the sewer, while leaving the large particles to be thrown away in the garbage. The strainer uses about two gallons per minute compared to the five-to-eight gallons per minute of the commercial disposals. Commercial kitchens often use scraping troughs or conveyors to remove and carry food scraps and other waste to a garbage disposer before the plates go into the dishwasher. The scraping system uses a trough of water that flows at a rate of between five and 15 gpm to carry garbage to the disposer. Conveyors (generally for larger facilities) use water forced through several jets at a rate of three to five gallons per minute to rinse food particles. Recirculating systems that strain out the solids for disposal and return the water to the trough, reduce water use to between three and five gpm. A cost-effective method that uses no water is to manually scrape food particles into the garbage or a garbage strainer before loading plates into the dishwasher. Commercial refrigerators are usually water-cooled. Older units are often cooled with water in a single-pass fashion, wasting thousands of gallons per day. New units contain a closed system where a cooling water loop uses a heat exchanger that transfers heat from pipes containing a refrigerant, to pipes containing water. The heat disperses from the pipes by evaporative cooling. Smaller units, such as those found in residential settings, use an air-cooled condenser as their heat exchanger. In natural convection air-coolers, the air flows freely over the condenser, cooling the refrigerant inside. Forced convection air-coolers use fans to blow the air across the condenser coils. These systems use no water. Ice cream and yogurt machines are water wasters when they use single-pass cooling water to remove heat from the compressors and product. A typical water-cooled ice cream or frozen yogurt machine uses 2 to 3 gallons per minute (or 1,200 gallons for every eight hours of operation) to cool the condenser whenever the unit is operating. Better alternatives are a closed cooling water loop or an air-cooled model. Air-cooled models use no water. A closed cooling water loop uses a heat exchanger, which transfers heat from pipes containing a refrigerant to pipes containing water. The heat disperses from the pipes by evaporative cooling. Dipper wells are used for rinsing and holding ice cream scoopers and other utensils. They typically use constantly running water for sanitary purposes. Low-flow systems conserve water, as do hands-free systems that use foot or knee pedals to turn the water on only when needed. Simply turning the flow down or even off during slow periods can save thousands of gallons of water per year. A combi-oven is an oven with three functions: convection, steam and combination cooking, thereby replacing stand-alone convection ovens and boiler-steamers. In the convection mode, the oven circulates dry heat which is ideal for pastries and breads. The steam mode injects water into the oven to poach fish, rice, vegetables, and other foods. The combi-oven typically uses nine gallons of water per hour compared to the 40 gallons per hour used by boiler-steamers. Another advantage of a combi-oven is the combination mode, which uses both dry heat and steam to maintain exact humidity levels, providing more control of the moisture levels in food, and cooking food up to 30 percent faster. Conventional woks run water continuously over the stove to prevent over-heating from the accumulated heat under the cook-top. Waterless or (air-cooled) woks allow the hot air to escape from two small air gaps that insulate the wok stove elements. This eliminates the need to use water as a cooling agent and therefore results in a 100 percent water savings. Steamers are usually very water intensive, especially the pressureless, boiler-style steamers. Boiler-steamers are connected to a water source and constantly drain water to prevent pressure build-up from the steam. They can consume up to 40 gallons of water per hour, averaging about 175,000 gallons per year. Models with the EPA EnergyStar certification use about ten percent less water, or 30 gallons per hour. A boilerless steamer (sometimes called "connectionless steamer") is much more water efficient than one that constantly drains water. In a boilerless steamer, the only water used is the amount needed to produce steam. Water is added manually to a reservoir in the bottom of the unit that has its own heating element and is drained at the end of the day. Since there is no connection to a water source, the boilerless steamer uses only about one to two gallons of water per hour, with a potential water savings of 174,500 gallons per year. In Arizona, up to 70 percent of residential water is used on the landscape. Water used to irrigate landscapes is often wasted due to inefficient irrigation systems. Significant water use reductions can be achieved through the use of new and emerging irrigation technologies. An irrigation master valve is typically installed at the point of connection to the water source. The master valve opens whenever any station is watering and closes when no station valves are on. A flow sensor installed just after the master valve detects leaks based on the programmed parameters. When used with a controller that can read a flow sensor, the controller will shut down a station valve when a leak is detected, and then move on to the next station in the program sequence. If connected to a central control system it will send a message back to the central computer about the problem and its location. Although not commonly used in the residential setting, they would provide a safety net for home irrigation systems, preventing uncontained or unnoticed leaks from flowing continuously until discovered. Sprinkler heads are nozzles or devices, which may or may not rotate, that distribute water under pressure through the air. Sprinklers that spray (often called "spray heads"), do not rotate. They apply water over a circular area in a fan-shaped stream. They have a high application rate, meaning that they they discharge a large volume of water in a relatively short amount of time (at an average rate of 1.4 inches per hour), which can lead to increased evaporation and to run-off. By contrast, rotor sprinkler heads emit a single or multi stream of water that rotates back and forth in a circular pattern. Rotor heads have a lower application rate (at an average rate of .7 inches per hour) and apply water more uniformly than spray heads. When located on a slope, a sprinkler head in the lowest places sometimes continue to flow for a few minutes after the sprinkler turns off. This phenomenon is called "low head drainage" and can be prevented by installing anti-drain check valves. Bubbler heads are typically used in planters, tree wells, or specialized landscape applications where deep localized watering is preferable. Water from the bubbler head comes through small orifices and either runs down from the emission device or spreads a few inches in an umbrella pattern. Bubbler emission devices are equipped with single or multiple port outlets. Drip irrigation is a system of valves, tubing and emitters that allows water to drip slowly at the root zone of each plant. These systems are efficient because they water only the root zone and eliminate run-off, water waste, and excessive evaporation. Various sizes of emitters, including multi-outlet emission devices, allow for the application of different gallons per hour in order to match a plant's water requirements. Emitter size can be increased as a plant grows or plugged if a plant dies or no longer needs supplemental irrigation. Irrigation controllers or timers are programmed to turn an irrigation system on and off based on a preset schedule. Recent advances in controllers have made them even more efficient. "Smart" controllers sometimes called evapotranspiration (ET)- based controllers, automatically adjust the watering schedule according to weather-based information, such as temperature and humidity. (ET is the amount of water lost from the soil through evaporation plus the plant's water loss, both of which are dramatically affected by weather conditions.) This information may be either pre-programmed into the controller based on historic data, or adjusted daily based on a signal from a local weather station or satellite. Smart controllers can reduce irrigation water use by 20-40 percent. Some controllers have sensors (shut-off devices) attached so that watering is temporarily stopped due to rain, wind, high soil moisture or freezing temperatures. Rain sensors are designed to stop irrigation in response to a specific amount of rainfall, such as 1/8 to one inch. When the sensors dry out (in a day or two), they turn the power to the valves back on. Rain sensors are mounted outside in an open area and are easy to install. They are available in both wireless and hard-wired versions and are connected to the shutoff valve on the common line of the automatic-watering system. Some states and many cities mandate the use of rain sensors in all new sprinkler systems. Soil moisture sensors measure the level of moisture in the soil and are frequently used in agriculture, on golf courses and in lawns. They are sometimes used in planting beds that have drip irrigation, however, more sensors are needed if plants have differing water needs and root depths. Soil moisture sensors stop irrigation if the soil is wet and resume irrigation when the soil is dry. A good system allows you to set the moisture level at which you want to stop and start irrigation. There are a variety of soil moisture sensor systems on the market at different price levels. Wind sensors turn off irrigation valves when the wind reaches a preset speed, e.g. 12 – 35 mph. These are more commonly used with automatic sprinkler systems to reduce evaporation and prevent the wind from blowing the spray away from the targeted areas. Freeze sensors automatically turn off irrigation valves when the temperature drops to a pre-set level, e.g., close to freezing. These are typically used in regions where irrigation systems are not decommissioned for the winter, yet still have a chance of frost. Sensors are sometimes combined into one unit to eliminate the need for separate sensors and installations. A combination unit that includes wind, rain and freeze sensors is sometimes called a "mini weather station" or "complete weather station." The sensors automatically shut off the irrigation system if there is too much rain or wind, or if it is too cold to irrigate They then reset the system when conditions are favorable. Installing a meter or sub-meter dedicated to measuring outdoor water usage can reduce sewer fees. Sub-meters quantify the amount of water used for landscaping and therefore not returned to the sewer. If you are unfamiliar with how to read your meter, refer to Reading Your Water Meter. Rainwater and Gray Water Harvesting are effective methods that can reduce the use of drinking water for landscape irrigation. These methods are even more beneficial when they are coupled with low-water-use and desert adapted plants. You can read more about these topics on our Landscaping page. A rainwater harvesting system is appropriate for large-scale landscapes such as parks, schools, commercial sites, parking lots and apartment complexes, as well as small-scale residential landscapes. Simple rainwater harvesting systems include gutters, downspouts and yard contouring to direct rainfall to plants. More complex systems store rainfall in rain barrels or cisterns, some equipped with filters and pumps. Gray water, the wastewater generated from domestic processes such as laundry and bathing (not from kitchen sinks or toilets), comprises 50-80 percent o f residential wastewater. Gray-water systems typically direct gray water for irrigation use. Some communities require gray-water systems in new construction, and rebates are sometimes available for installing a gray-water system as a retrofit. All residential systems must follow the Arizona Department of Environmental Quality guidelines. Swimming pools, decorative ponds, fountains and waterfalls can consume high volumes of water through evaporation. The amount of evaporation is related to outside temperatures, wind velocity and other factors. For example, in Phoenix and Tucson, the average evaporation rate is approximately six feet per year, most of which occurs in summer. Other sources of water loss in addition to evaporation are filter backwashing, pool draining, splashing, and leaks. By installing a submeter, variations in water use can be identified, such as unusually high water use caused by leaks, cracks or tears in liners. The meter will help identify abnormal water usage so it can be remedied as soon as it is discovered. Ponds, fountains and waterfalls should recirculate water by having a reservoir pan to hold water and a pump that circulates it. Water may need to be added several times a week depending on the rate of evaporation, unless the feature has a dedicated line and float. Some communities have regulations on recirculated water in play fountains. New products and kits are becoming available that collect and store rainwater for use in fountains, ponds or waterfalls. The water storage units are usually below ground and a pump recirculates the collected rainwater through the water feature systems. Some communities have ordinances that restrict the type and size of water features to help reduce water loss from evaporation. If you own or operate a commercial car wash, see Water Saving Technologies for Commercial Car Washes. Of the two main types of commercial car washes, conveyor or in-bay, the conveyor system uses less water. Conveyor systems (where the car moves through a series of cleaning operations) use approximately 44 gallons of water per vehicle and lose 17 percent of that to evaporation and carryout. In-bay systems (where washing equipment is rotated around a stationary vehicle) use approximately 72.5 gallons per vehicle and lose 33 percent of the water to evaporation and carryout. Regardless of the type of car wash, recirculating (recycling) systems are an important part of any water-wise car wash. These systems take soapy run-off water, clean it, and send it back for use on another vehicle. Self-serve vehicle washes use less water than commercial car washes or washing vehicles at home. Typically, self-serve vehicle car washes have an equipment room where water is mixed with cleaning agents which then come out of a wand or brush. Because customers are unsupervised, they often discard oil and debris in the wash troughs making water recycling difficult. Self serve car washes can save water by using pressure nozzles with flow-rates less than three gpm, deionization equipment rather than water-softening or reverse osmosis systems for "spot-free" rinse options, and reuse of expelled water if reverse osmosis systems are in place. The expelled water could be used for the wash cycles or to irrigate landscapes. Automatic shut-off nozzles have a lever on the back which, when depressed, allows water to flow out of the hose. When released, the water stops, thereby preventing water flow when it is not needed. A water broom is a type of power washer. It uses air and water pressure to clean surface areas, and is excellent for “light-duty” cleaning such as pool decking and sidewalks.Water brooms use about two gallons of water per minute (gpm) compared to the 8-18 gpm used by a traditional hose nozzle. Using a water broom instead of a hose to clean surface areas can reduce water use by more than 75 percent as well as require less labor and time. Water brooms shouldn’t be used for heavy duty application such as removing bird droppings, since the broom would have to be run several times over the same spot. Most uses of water in laboratories are relatively small, and generally have limited potential for water conservation. Uses include water for mixing solutions, washing glassware and other equipment, and for sterilizers. The EPA and Department of Energy recommend that laboratories, especially those in large hospitals, look at the potential for generating and collecting non-potable, clean water such as the discharge from once-through cooling systems or reverse osmosis. For additional information see ADWR Medical & Laboratory Conservation Fact Sheet. For other water uses in medical facilities such as for kitchens. laundry, irrigation, heating & cooling, and plumbing, see the sections above. Low-flow aerators are extremely effective at reducing water use. Aerators can be attached to older, high-volume faucets to reduce their flow rate to 2.5 gpm or less. Aerators add air to the flow stream, resulting in a spray-like flow, while maintaining water pressure. Some aerators can reduce water flow to .5 gpm or less, at a fraction of the costs of replacing faucets. The rated flow of an aerator is imprinted on its side. Traditional hood exhaust systems use water to create a vacuum. Water-saving dry vacuums use air pressure instead of water to create a vacuum. Exhaust hoods may include fume scrubbers (systems that remove fumes and substances from the exhaust before releasing it to the atmosphere). These fume scrubbers use large quantities of water, and therefore should be equipped with recirculating systems. X-ray, MRI and CT equipment that uses film imaging are water- intensive. Water-conserving imaging equipment use digital technologies which allow the images to be displayed on a screen and saved to a hard-drive. Where film imaging cannot be avoided, use a self-contained image-developing unit, called a "mini-lab," to process the film. These units use chemicals instead of water in the development process and dispose of the spent chemicals in a reservoir adjacent to the mini-lab. Recirculating systems should be used for large wet-chemistry and water-rinse x-ray technologies. Sterilizers frequently use running streams of water to cool steam from the autoclaves, then discharge the water to the sewer. Sterilizers with recirculation systems (either built-in or retrofitted) use the water multiple times before discharging it into the sewer. A water-saving retrofit kit for autoclaves (pressure chambers for producing chemical reactions) monitors the temperature of the water coming out of the autoclave and adds cold water only when the temperature is greater than 140ºF. Recirculating chiller units are recommended for cooling lab equipment (such as large dry vacuum systems, sterilizers, automated analyzers, etc. ), rather than using a stream of water and once-through cooling systems.